Images of the MOG's new battery configuration as described in our last post. These images give a much clearer picture of the new, more efficient coupling of the batteries used for MOG's solar power. Please refer to last post for details. 1- One partition removed to show comparison of the old parallel 'inline' group and a single battery turned 90 degree to optimize mass and space. 2-The new 'wireless' clamp method eases change-outs and facilitates obstruction free watering. With a thin plastic blade, battery handles are removed in moments, stored for later reuse. 3-A test placement of the negative and positive bus bars linking 5 sets of the 24 volt DC packs required no tools and about one minute start to finish. Faster than one standard nut/cable clamp. The Great Loop adventure for the MOG Solar Powered Motor Yacht continues to evolve. Most of the evolution, at this point, is in the mechanics of the craft. On the one hand, all concerned would be heartened by the yacht leaving the dockside for more than a day. On the other hand, in order to go forth into the day or night with confidence, all must work perfectly for one day or 1000 days. 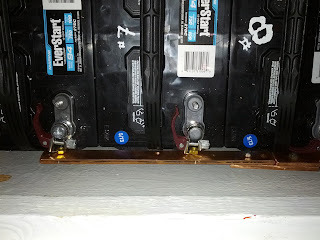 To the casual observer, turning the batteries 90 degrees by reworking the battery box is a dubious improvement. 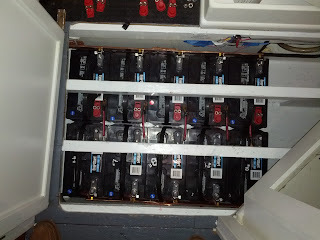 The weeks of work and planning to literally rip out the box internals and ditch the cables and redesign the box for solid copper bus bar might be thought of as a waste. Copper bus bar is expensive and more difficult around which to design and fabricate. Why then? 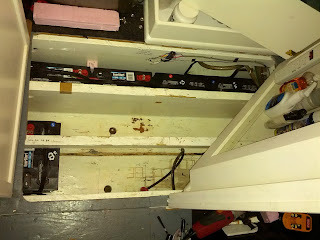 Now that the boat is nearly ready, the batteries need to be shifted as trim ballast, future allowance must be made for different size super batteries, selective battery bank switching added, safety/insurance regulations met and cable corrosion reduced by replacing battery cabling with insulated bus bar. When previous system anomalies arose out of the brief sea trial process a few months ago, the steering and power controls were reworked to operate under ever more severe conditions and resulted in a more robust system. All the power came from one area in the boat that was now indicated as 'satisfactory' but was not 'excellent'. With no gas stations at the side of the watery highway and no safety lanes, a boat needs to be much more than satisfactory. There are a few more small items to be incorporated in the battery box area but the big work is complete. Higher DC current transmission, lower heat, better ballast shift response, improved battery watering and easier maintenance access is now a reality. This all means the Great Loop is pushed back but not out. Local sea trials will be expanded while actually engaged in the Great Loop. The conclusion, there is more than one way to approach the Great Loop. MOG missed the planned launch this spring from Wilmington, NC but will depart this month along the Outer Banks of North Carolina to Virginia. The first leg of the MOG’s Great Loop will be an “NC Loop”. This NC Loop is a combination extended “shake-down” voyage for the MOG prototype and the beginning of the quest to complete the Great Loop with a solar powered 40’ vessel. The MOG will rack up miles and destinations as part of the Great Loop. The current plan is to travel north from Wilmington along the western side of the Outer Banks (just inside from the ocean). The scheduled return route will be along the Dismal Swamp Canal, ICW, and streams and estuaries that are impossible to navigate with most vessels (far inside eastern NC). The MOG, with its 18” draft, is uniquely suited to explore these waters. Not only is the shallow draft unique in a 40’ motor yacht, but the MOG’s solar power propulsion system removes the need for fuel docks along the route. The MOG is very much self-contained and can plot a course with little regard to supplies along the desired route. The MOG (definition- to move forward deliberately) has no set time schedule. The MOG has the ability to “Go Where No Person (in a 40’ motor yacht) has ever gone before” and we intend to enjoy the opportunities that present themselves along the way. Visit www.mogcanalboat.com for details on what makes the MOG prototype unique. Its design, steering by “Joy Stick”, battery and solar panel details, propulsion, and a completely fresh approach and attitude on travel by water. Stay tuned for launch date and updates.